When babies start teething somewhere around 4 to 6 months they start putting just about anything in their mouths to chew on. It is something that they seek out to get some relief from their sore gums. Most often babies will start with chewing on their hands and fingers, which can cause them to become red and sore. The last thing you want is a baby with sore gums and sore hands. Teething toys are a great way to help keep their hands out of their mouth and soothe those sore gums. There are tons of teethers on the market, but not all are safe. We have created a list of the best teething toys for babies. These teething toys are safe and will give your babies some much-needed relief. We want to equip you with all of the most pertinent information when you're shopping for a new baby teether. That's why we've updated our format to include numerical ratings with feedback from editors and parents just like yourself. The list has been reviewed and updated. We created a list that all the products are safe for babies and are in stock. It’s the perfect gift for any occasion whether it’s a baby shower, your baby's birthday, or that first sign of a new tooth coming in. It’s also 100% dishwasher safe and super easy to clean if you don’t have the luxury of a dishwasher, all you need is soap! We love this product because it is so small it is perfect for those tiny hands. As parents, you won’t have to worry about your child choking because there’s nothing that you can fill or smaller parts that come with this tiny elephant. Baby Elefun teethers are perfect for your baby while they’re uncomfortable gaining that new tooth. This special elephant is easy for your baby to hold onto and your baby will love chewing away on this metal-free silicone design. It’s the perfect stocking stuffer for the upcoming holiday season for your fussy little one. What's great about this is your baby can chew along perfectly, or if you want it a little colder to help with even some sensory skills, you can stick this tiny elephant in your fridge to help add a bit more comfort. With Ashtonbee’s five-pack of baby teething toys, you can always be prepared for the next time your child becomes fussy because of their painful gums. Each of the five teethers are free of BPA, PVC, lead, BPS, and phthalates, thus your child will not come into contact with any harmful chemicals while they are chewing. Your little one can easily grasp each teether as they are designed with a handle. Furthermore, your child will increase their fine-motor skills as they grasp the handles. The variety of curves and textures will stimulate your child’s teeth to grow as well as massage their gums. The bright colors of each teether will stimulate your child’s sensory development. The silicone material makes them easy to clean if accidentally dropped. Receiving five at one time will allow you to keep one in your car, house, bag, and anywhere else you might need to keep one. The design makes it very attractive to the child because it is in the shape of objects that he or she already associates with things that bring pleasure or relief--baby bottles and fruits! This naturalistic effect cements positive correlation and a causal relationship with the product. It is made with 100 percent medical-grade silicone and comes in varying textures, so the child can find just the right pressure for relief. It has a simple yet classic teething toy design. The rings allow for motor and tactile sensory development while the various colors and shapes can help with visual and cognitive development. The hygienic carrying case is nothing short of amazing. With the case, you can easily throw the teether in your bag without worrying about what dust and debris it will pick up. However, if it does end up getting dirty the silicone material makes it super easy to clean. Along with the teether, you will receive a hygienic carrying case that makes transporting it super easy. If the teether does get dirty, the silicone material is easy to clean. You can hand wash it or throw it in the dishwasher. The case will also help keep the teether clean. The fish-shaped design makes this teether great for front and back teeth. There are no added parts, thus you won’t have to worry about anything breaking off. The material is super soft and BPA free, thus making it safe for your child’s mouth. Designed for babies three months and up, this teether can easily fit in and be grasped by tiny hands. When purchasing you can choose between a blue or pink teether. The Nuby Silicone Teethe-eez will make the teething process a little easier for both you and your baby. This teether is 100% silicone and designed with soft bristles that will soothe, clean, and stimulate your child’s gums. The design of the Comotomo Silicone is truly unique. It has a great soft feel to it and the nubs are great for them to chew on instead of their fingers. As the world begins to change right before us why would we still be using the same old boring teething toys and shapes that we used when we were kids? The teething toys that kids use are one of their first experiences with fine tuning their developmental skills so why wouldn’t you want to make sure it was the make enriching experience possible? This teether is changing the world one tooth at a time. It is an inspired piece that has been designed to stimulate what their fingers feel like in their mouth. Teething babies love chewing on their fingers so why not give them a toy that is as close to that as possible? The design also makes it easy for them to grab and hold tightly. There are multiple places for them to grasp it and many biting points. It has been constructed from hygienic silicone that is 100% safe for all little ones, plus it contains no BPA, PVC, and Phthalates at all. The teether is easy to clean, just place in boiling water, the top rack of the dishwasher, or any sterilizer. This teether will bring joy to your little one and some comfort to you know they are using something safe and a toy that is designed just for them. For many babies, teething toys are their first experience with toys or objects that they are able to put into their mouths themselves. Up to this point, babies are using only getting pacifiers and bottles. Teethers with easy to grab shapes are great for oral motor skills. It also the mouth to develop the skill set that is needed for their next big step, eating solid food. Super cute design and the shape is easy for the little ones to hold. The soft silicone material makes a great chewing toy, plus being able to attach it to a pacifier clip makes it great for on the go. 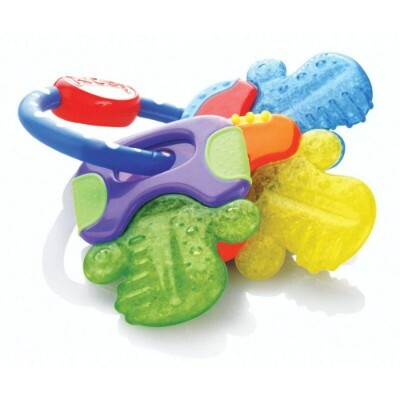 Great quality teether that has been created from high quality silicone. This teether has been created from silicone that is so safe that they use the same grade of silicone for food items. The mold of the teether has been created with grips that are located on the back of the teether making it easy for little hands to be able to grasp and chew. It easily attaches to a pacifier clip. This gives them access to the teether and also keeps it safe from falling on the floor when they are not using it. The teeth can easily be cleaned with warm water and dish soap, thoroughly rinsed and it is ready to go. 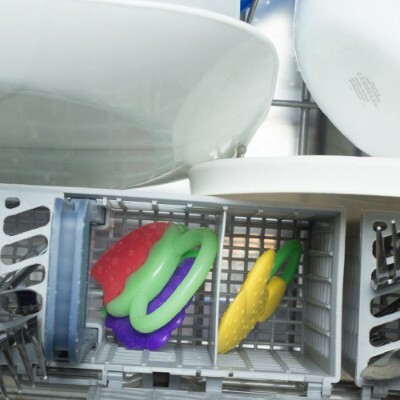 If washing it is not your thing, it can also be placed in the dishwasher on the top rake. 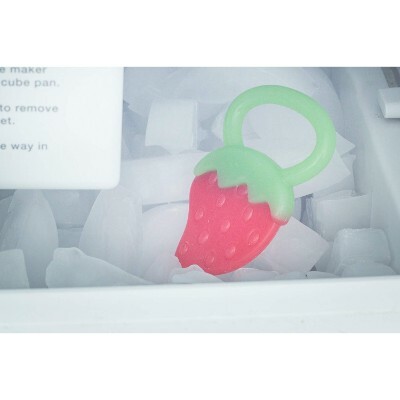 The teether can also be placed in the freezer for a cool soothing feeling. Constructed from a super durable silicone material that will last well through their teething period of life. The silicone it is created from contains no BPA or Phthalates plus is nontoxic. It is very safe and it great for the development of their oral and motor skill development. When the little ones are cutting their front teeth, middle, or the back molars this is an effective teether for the whole process. From crying nights to whinny day’s babies that are cutting teeth are having a rough enough time. So provide them with a soft chewing teether to soothe their gums and provide them some relief when you can. It also is a super cute raccoon design. Teethers are a great way to develop fine motor skills at a young age. The grasping the teether and placing it to the mouth develops the skill set and sets them up for being able to master other fine motor skills that require grasping objects and placing them in a certain place. With four BPA-free teething toys in one set, you are truly getting the most bang for your buck. The variety of textures will appeal to your child’s sensory development as well as soothe their aching gums. One of the most popular teething toys in our list is the Baby Teether Toys by Ike & Leo. This set of 4 teethers and pacifiers is what you will need for your baby as he or she can still use it until he or she reaches toddlerhood. It comes with a pacifier clip so you won’t have to worry about the teething toys getting lost. All toys are made of silicone which has been rated and approved by the FDA as 100 percent food grade. It is also free of any harmful chemicals like phthalates, PVC, and BPA. This teething toy set is by far one of the most cost-efficient of any on this list and can add an element of inspiration for your little one. It comes with four different teething toys to help keep babies engaged as they chew away. Meanwhile, each toy is a representation of fruit to help inspire healthy eating habits early on. 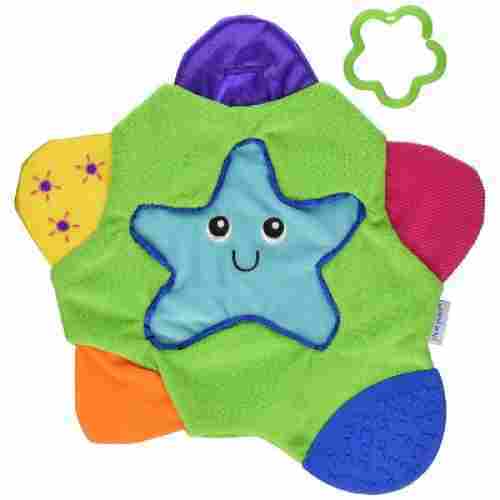 If you prefer multiple teething surfaces for your baby, then you need The First Years’ Star Teething Blanket. The five points on the teething blanket are made of different, yet equally safe and effective, teething surfaces. There are soft terry cloth and even a crinkly satin. The soft and chewy textures provide babies with a variety of experiences. Additionally, a squeaker is built-in into one of the star’s points. Each point comes in a different color and comes with a teething blanket loop for easier transport. Nothing comes more naturally for a child than to chew on his or her blankie or pillow! It was the original chew toy before there even was a chew toy! It’s convenient because there’s no worry of slippage or of it falling. Baby can crawl around with it, sit with it, lay with it, all within reach of hands and mouth! The five points of the star design give a variety of teething texture experiences! By far, the most playful option for a teething baby. It’s a different type of teething toy which is, nevertheless, effective in soothing sore gums. It’s also beneficial in developing babies’ visual, tactile, and auditory skills while at the same time encouraging mastery of gross motor skills. Designed with PurIce technology, these teethers will stay cooler longer. The bright colors will stimulate their senses while the different textures will soothe their pain. For added relief to your child’s mouth, place this teether into the refrigerator and allow it to cool. This teether is available in a variety of colors. It is lightweight and easy to transport, so you can easily take this teether anywhere you go. The Nuby Ice Gel Teether keys provide your child relief by offering a variety of textures for them to chew on. 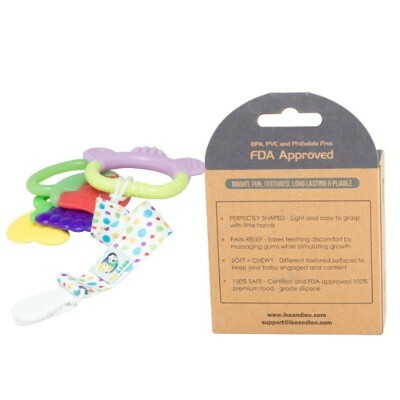 Each of the three keys on this teether ring are BPA-free and will assist in the eruption of the front, middle, and back teeth. This has all the hallmarks of a great education and socialization toy, along with its practicality! The key ring not only keeps all of the teethers in one place and graspable, the fact that they are aligned on a ring aids in developing functions in counting, causal relationship, and the subtle manipulation of objects through the selection of one teething key over another. In addition, the varying colors of the keys provide visual stimulation, adding to the soothing quality of relief from sore gums. There more than likely isn’t a more adorable teether than Sophie the Giraffe. 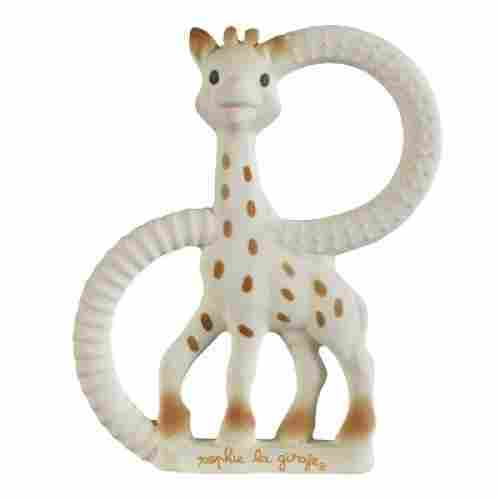 Composed of natural rubber and colored with natural dyes, this giraffe is perfectly safe to go into your child’s mouth. This is the most natural choice….I mean, literally, the most natural choice when it comes to a teething toy. All the concerns and certifications on safety out the window! 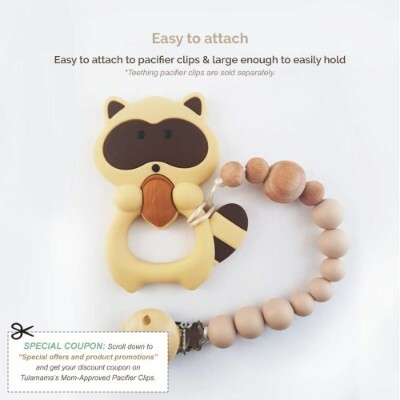 It’s a simpler design for a more advanced teether -- the two looped handles of varying textures can be seen as more for gnawing than for massaging sore gums. And, the handles are more than a handful for baby’s grasp! Equipped with two different textured teething rings, your little one can choose the side that is most comfortable for them to gnaw on. With the teether being composed of only natural products, you can relax knowing they're safe as they chew. She is designed with two teething rings, each with a different texture. The ring near Sophie's head is designed with raised bumps, while the ring near her feet is designed with ridges. This teether arrives in an adorable gift box which makes it the perfect baby shower gift. In addition to helping ease baby's pain, the Winkel rattle is designed to provide a full sensory experience. 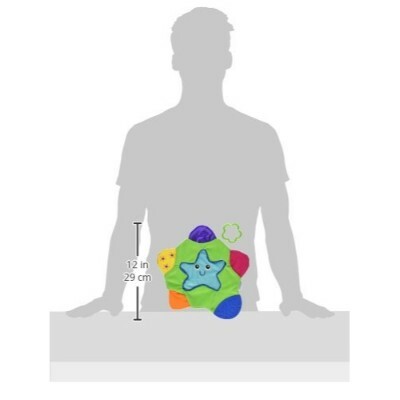 Featuring a similar structure to that of an atom this teething toy not only has an intricate and engaging design but is incredibly colorful to give your baby a complete range of pleasing aesthetics. 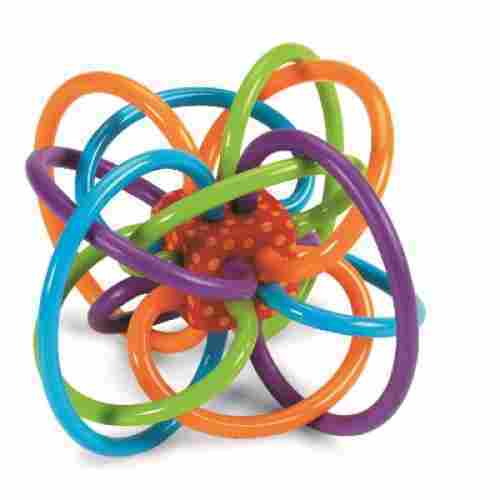 The endless loop rings and facets will keep the baby constantly engaged in trying to find the end point! The quiet rattle has a subdued effect that’s just enough as a teaching tool in understanding cause and effect, while not loud to annoy parents and other adults. Manhattan has been a trusted manufacturer since 1979 and makes this teething toy BPA-Free, so safety and health are never the main concern. The loops are soft and pliable. Meanwhile, the entire design is meant to be lightweight and ideal for little hands to hold and maneuver. This toy, is BPA Free, giving parents a reason to rest well, despite the disruption caused to our household and rest routine, by a teething infant. To ensure this toy does indeed engulf baby in stimulation, within the cube's center are small rattling beads that offer auditory stimulation. The Winkel Rattle, made by Manhattan Toys is an excellent aid to help soothe your baby's sore gums, safe for ages 0-24 months. It’s not just a teething toy; it’s also an activity center. It can help babies develop their visual, tactile, and auditory skills. It’s also great for developing gross motor skills. Of course, it’s excellent for helping babies relieve the pressure off their gums. It’s best not to underestimate your baby’s strength, even at just a few months old. Early teethers may have fragile gums, but they can still gnaw through weak, poorly made toys. We want to assure you that we’ve chosen teethers with proven durability, thanks to innovative construction methods and durable materials. Solid constructions can come from numerous processes, such as individual knotting for beads, one-piece construction for loops and beads, or the usage of premium-grade silicone. Premium-grade silicone, i.e., 100 percent medical- or food-grade silicone is particularly important for water-filled teethers since these are meant to be extra-soft for very young, sensitive gums. However, water can leak from the unit if the material doesn’t hold up time and time again. That’s why we made sure to only select teething toys made from the highest-grade materials. The combination of premium materials and sound manufacturing techniques is the key to making safe, effective products for all your baby’s teething needs. This is our first criteria for anything that goes in a baby’s mouth. Having said that, “contaminant-free” can mean different things, depending on standards and regulations from various consumer safety agencies within, and outside of the United States. We’ve tried to be as helpful as possible by stating each product’s non-contaminants policy, but we did make sure to select baby products that are BPA-free. Most of our picks are also free of contaminants like phthalates, PVC, lead, and latex. Some even go so far as to avoid petroleum, which is admirable. However, being completely free of any and all toxins is virtually impossible. In all honesty, deciding what is safest for your baby requires speaking with your pediatrician. He or she can make recommendations based on your baby’s unique medical and developmental needs. Babies with certain conditions, for example, may need to avoid very specific contaminants, and perhaps even certain shapes and textures that can pose physical hazards. Your pediatrician may also recommend specific cleaning and sterilization methods, such as boiling in hot water and air drying, rather than using the dishwasher. Teething is a very common and at times misunderstood phase of development in a child…in much the same ways that growing pains are! Past remedies and treatments for teething ranged from parents putting whiskey on their child’s gums to allowing them to chew on a leather strap or a cured piece of meat! In the ’70s and ’80s, there was the advent of Anbesol and children’s Tylenol to do the trick! Luckily, we have evolved more as a society and tend to avoid giving our children toxins as we did in the past! As with many things that have come to light, we can now see teething as an integral learning phase for both parents and children. Not only do teething toys help to alleviate gum pain, but the pressure also aids in strengthening the incoming teeth….this is one of the reasons that it is so vital to finding a teething toy which can also reach the back molars as well as the front teeth coming in! It is even shown that teething toys and pacifiers have been helpful in speech and auditory development. This all has to do with the movement and placement of the infant’s tongue. What a child has in his or her mouth effects what sounds they are able to perceive–discerning each vowel and consonant that comes in more distinctively than older children and adults. You can look at your baby’s teething as the process by which his or her very first deciduous teeth break through his or her gums. This usually occurs by the time your baby reaches 6 months old, although it is not uncommon to see babies as young as 3 months and as old as 1 year to have their very first primary, deciduous, baby, or milk tooth. What can be expected is that by 3 years of age, your baby would have already erupted 20 milk or baby teeth. During the first eruption, your baby’s first tooth will most likely appear on the lower front of his or her gums. One to two months later, you can expect the upper front teeth. You may wonder why we need to have baby teeth only to have them replaced by more permanent ones. Well, it’s all about developing the oral cavity of your baby. You see, it is your baby’s milk teeth that will maintain the arch length of his or her jaw. This is crucial because it is in these same places where their permanent teeth will develop. Milk teeth serve to guide the eruption pathway of your baby’s permanent teeth. It also helps in the formation and development of the jaw bones and muscles. But, did you know that the most important role milk teeth have to play in your baby’s development is that they serve in the development of his or her speech as well as help improve his or her smile? We, as adults, are often so conscious about the appearance of our teeth. Among children, this can have a significant impact as well. Moreover, their nutrition may be affected if they don’t have their milk teeth as they will have problems chewing and grinding some of their food. Now, why do we need a teething toy? Well, remember the baby teeth will be breaking out of the gums which can lead to inflammation, causing soreness, swelling, and even some pain. Teething toys serve to relieve the pressure off your baby’s gums. This helps them feel a lot better during the whole teething process. And since we are talking about babies, it is often a lot better to use a teething toy that can also help develop their other senses as well as psychomotor skills. This way, we are tending to the overall development of our babies. Teething is arguably the most unpredictable process in a baby’s development. Some babies are born with one or two teeth, others don’t have teeth even by the first year. There’s also no way to predict how long it will take your baby to have a full set of teeth from the time the first ones come in. That means your baby can go through many different stages of teething over a long period of time. Hence, versatility–specifically, adaptability–was one of our primary criteria when we looked at baby teethers and teething toys. Versatility can be seen in many features, such as beads of different shapes, different grades of thickness and flexibility, and varying textures such as ridges and nubs. Our teether picks encompass one or more of these features to give babies a well-rounded chewing experience that will grow with them, even into the toddler years. Some of our picks are also appropriate for children with oral motor disorders or developmental disorders like autism. However, they should only be used for these purposes upon recommendation from a licensed pediatric specialist. q: Are these toys safe to put in the fridge or freezer? Yes and no. It is not recommended to use these toys in the freezer as extreme temperatures can compromise the integrity of the toy’s structure. They can, however, be put into the refrigerator to provide your little one with a cooling and calming sensation that can help to reduce inflammation and gum irritation. q: How can I effectively wash these toys without causing them damage? Extreme temperatures, as mentioned above, can cause damaging effects. There are some products that state they are designed to withstand that kind of heat. If you find yours is not one of them, or just don’t care to take that kind of risk, you can rinse them in warm soapy water. Let them soak for a few minutes. Scrub in a circular motion as this action can help to agitate and lift bacteria from the toy’s surface. Finish with a rinse and let them sit to air dry. Be sure the toy is completely dry because moisture creates a perfect environment for lingering bacteria to regrow. q: I’ve noticed my baby drooling more excessively with a teether, is this normal? Can I prevent this? Babies drool, this is unavoidable. If you find with these toys, your baby is drooling more excessively than before, it’s because the extra stimulation causes more salivation. Keeping a burp rag or extra cloth on hand will help you with the clean-up. Consider also switching toys out regularly as this can help minimize drooling. Differing textures will provide stimulation to different areas of the mouth and gums, helping to break the amount of occurring salivation. q: Does my child receive any long-term benefits from the use of these toys? In an unexpected light, these toys can help babies and toddlers gain a basic understanding of the concept of cause and effect. They experience pain and discomfort and are given a solution to solve their problem. This creates a pathway in their brain to reinforce their understanding of finding a solution. These toys help children learn very early on about problem-solving. q: Are these toys safe to use with other teething aids like gels? This choice is entirely up to you as a parent or guardian; teething gels don’t alter or affect a toy’s effectiveness. If you are already open to using teething gels, then you can apply a small amount to the surface of the toy or even directly to the gums. However, if you are concerned about your baby’s exposure to harsh or toxic chemicals, you may want to avoid teething gels altogether as some do contain ingredients, which while proven to relieve pain and swelling, can also cause damaging effects to the liver and kidneys. q: Is silicone better or more effective than plastic? There is so much controversy around the use of plastic these days. In recent years, we’ve seen how its chemical make-up has had some undesirable effects on our health, not to mention our planet. 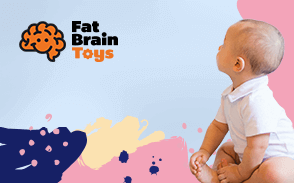 We highly recommend using silicone-based toys as they are FDA-approved, better for the environment and may be safer and less harsh for your baby’s delicate, growing body. q: Is a solid teether better than a gel-filled toy? Both solid and gel-filled toys provide their own lists of benefits, so choosing between the two is easier than you think. Consider your baby’s developmental level. To determine which is best for your little one, consider at which stage of teething they are currently experiencing. For example, your baby, aged 3 months, may experience increased tenderness as their teeth are brand new and still breaking through the gum’s surface. A solid teething toy may apply too much pressure to your baby’s delicate gums. Additionally, consider how experienced your baby is with chewing or gumming as new objects in the mouth can be a little off-putting or frightening, a softer or gel-filled toy will be less abrasive. If your baby is a little older and has already been exposed to some solids, then a firmer toy is likely to be more effective. q: Are silicone teethers safer than plastic? As a general rule, we would advise going with silicone, although there are other FDA-approved thermo polymers that can be made perfectly safe. The benefit to silicone is that it’s extremely durable and flexible at the same time. It’s also freezer-friendly and chills quickly. The safest, highest grade of silicone is medical-grade, like Bebe By Me’s cookie teethers. However, 100 percent food-grade silicone has been approved by the FDA as being safe, especially when it’s free from contaminants like BPA, phthalates, and PVC. This is another area where your pediatrician’s input may be needed. Depending on your baby’s overall health, he or she may recommend medical-grade silicone, which has the advantage of being the same silicone used in hospitals. Your pediatrician may also recommend specific sterilizing techniques since germ control is just as important as the grade of material. q: Would any of these teethers work for older kids? Quite a few of these teethers do work wonders for older kids with oral motor problems. They’ve even been known to calm down children with the developmental disorder when they act out at home or in public. Of course, you should always get your doctor or therapist’s approval beforehand. Kids with autism, for example, may need a really thick, meaty chew to calm them down when they’re at peak frustration levels. In such cases, it’s nice to have different chewing levels to fit your child’s needs.